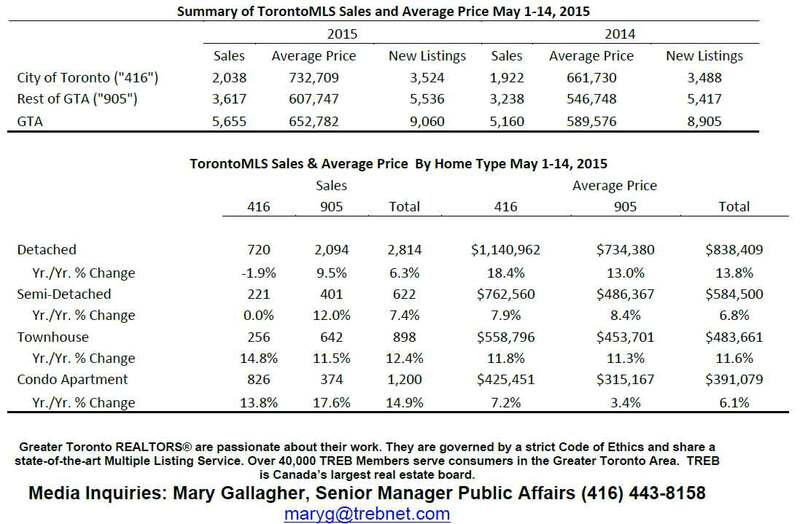 Toronto Real Estate Board (TREB) reports a 9.6 per cent year over year increase in real estate sales based on the sales made in Greater Toronto Area REALTORS® during the first 14 days of May. There were 5,655 sales reported in the first two weeks of May 2015 compared to 5,160 sales during the same period in May 2014. The average selling price for transactions reported during the first 14 days of May was $ 652,782 for all home types combined – up by 10.7 per cent compared to the first two weeks of May 2014. The strongest price growth was experienced in the detached market segment, with the average price up by 13.8 per cent. of homes sold has also been an important factor in pushing the average price higher,” said Jason Mercer, TREB’s Director of Market Analysis.